An attic apartment with a terrace just a few steps from the center. In a quiet location with a small park behind the house. Suitable for a family or a small group who came to see the history and rush of the city, but in the evening, they want to relax with a glass of wine with a view of the city. The businessman comes to his business trip, which needs to be in center but quiet for work. The apartment has everything what you need for your stay. Kitchen, TV, washing-machine, wi-fi, garage. An attic apartment with a terrace just a few steps from the center. In a quiet location with a small park behind the house. Suitable for a family or a small group who came to see the history and rush of the city, but in the evening, she wants to relax with a glass of wine with a view of the city. The businessman also comes to his business trip, which needs to be as close as possible to the center but to have his peace of mind for work. 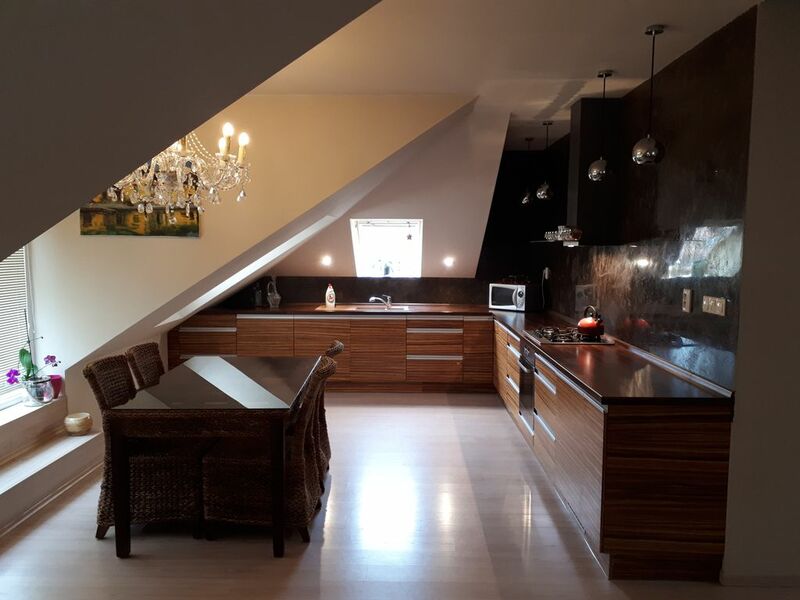 This apartment is located in the wider center of the capital - Bratislava. Bratislava is a nice historical town with many monuments. Close to Vienna with a light motorway access. In the case of a business trip you are close to all important offices. Parking is provided in the garage right next to the house. Towels and hygienic requisites. If you are a tourist by public transport, take advantage of the location of our apartment. The main bus station is just a 5-minute walk away. The main train station is quickly transported by bus. Historical and commercial center of the city within walking distance. There are plenty of restaurants and cafes nearby. The apartment is equipped with kitchen. Dining table and comfortable sitting in the living area. Two separate rooms will provide enough privacy for each couple. For long-term stay, you will appreciate large cupboards and washing machine. If you wish to have a glass of wine after a hard day, you will certainly enjoy our terrace.